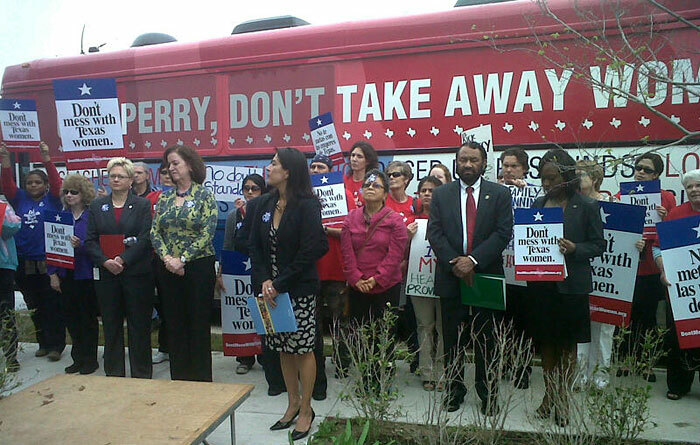 It was a huge rally for women not happy with the direction of Texas' Women's Health Program. That program provides a number of health care services to women who make too much to be eligible for Medicaid. But the program could come to an end soon, unless Texas lawmakers or the federal government change the policy. This is what it sounded like just outside the entrance to Planned Parenthood’s Houston headquarters near the Gulf Freeway. Outside the parking lot near the street, a line of anti-abortion protestors holding signs and praying. Planned Parenthood’s Rochelle Tafolla and the 100 or more other women at the rally blame Governor Rick Perry for trying to exclude Planned Parenthood from the program. Most of the money for the program comes from the federal government and the Health and Human Services Department says Texas will lose federal funding if it continues with its plan to keep Planned Parenthood out. Doctor Michelle Curtis, an OB-GYN, talked about the ramifications of ending the Women’s Health Program. Jonee Longoria is a client of WHP and told the crowd how it helped her get through some tough times. Earlier in the day Congresswoman Sheila Jackson Lee held a meeting on the matter and vowed to get more time from the Obama administration to work out a solution. The women are putting the blame on Governor Perry, but on his website the governor says it is the Obama administration that are the bad guys. The federal government is the one that’ll be denying care to women by defunding the women’s health program.